A Venetian-era village nestled in a hollow on the north slope of island summit Mt Pandokrátor, was abandoned from the 1960s onwards, resulting in a medieval time-capsule. The most noteworthy single monument is the 14th-century church of Agios Iákovos O Pérsis at the village approach. This was restored during 2013-14 under the supervision of the Byzantine archaeological authorities, with vivid frescoes uncovered and conserved, and it may be open to the public late in 2016 or early in 2017. Since the 1990s, the village has attracted both casual visitors and those after second-home restoration projects. 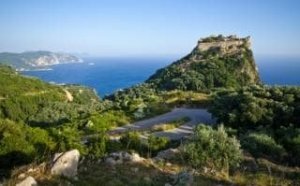 Paleá Períthia lies astride the long-distance Corfu Trail (plus is a trailhead for more worthwhile, shorter hikes to nearby villages), though wild bulls roam the countryside – ask local advice as to their current whereabouts. 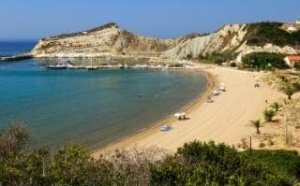 Several good tavernas also make it a popular excursion target. 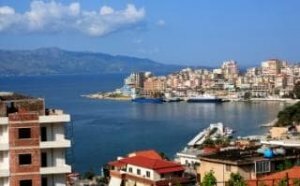 This mass-market resort, at the end of the corniche route threading through the more rarified havens of “Kensington on Sea”, is one of the few north-coast spots that has kept its charm. It has been a resort of sorts since Roman imperial times – Tiberius had a villa here, and Nero paid a musical visit with his lyre in AD 66 – and it’s easy to see why, with a deeply indented fishing port flanked by a small Byzantine-Angevin castle dating mostly from the 13th century (always open to visit). The path up to the castle starts immediately opposite medieval Kassopítra church (daily 10am–3pm), built during the 4th century on the site of the local ancient Zeus temple (its foundations two floor-layers below) and well worth a glance inside. The latest church dates from after the 1537 Ottoman sack of Corfu, with more Venetian rebuilding around 1590; to that period belongs a superb fresco of the Virgin Platytera with angels, in the apse. There are plenty of small beaches within walking or cycling distance: four protected, popular ones fringing the castle headland, plus Kogevínas (aka Sykiá) and Avláki east of town. Despite repairs and consolidation, there’s not much left inside this compact castle besides an underground church and some cisterns, but the views amply reward the short climb to the summit with its little chapel and much older rock-cut tombs beside it. Originally a 12th-century foundation of Byzantine emperor Manuel I Komnenos, the Venetians later used Angelókastro as a watchpoint to survey Adriatic sea-lanes – at the first sign of trouble, signal fires relayed the news to Kérkyra Town’s fortresses. Opening hours are erratic, and it may even be left unlocked, but assume entrance allowed only May–Sept Mon–Fri 8.30am–3pm. 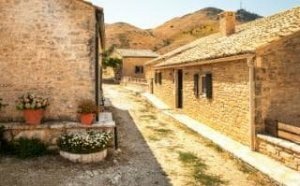 History and Folklore Museum of Central Corfu, Sinarádes well signposted near the north entrance of an appealing village, this traditional Corfiot house (May-Oct Mon–Sat 9.30am–2pm) holds two floors worth of exhibits. The ground floor has been left essentially as it was when inhabited, while the single-room upstairs gallery is devoted to a miscellany of bygone rural impedimenta and household widgets. The star exhibit is a surviving chunk of papyrélla raft made of cane fennel, of a type used along Corfu’s west coast until the 1950s; equally intriguing are a moray-eel trap of the same material, a wicker cage to keep toddlers from wandering off, and two ‘birthing’ saddles used by local women whilst in labour. Climb Ágii Déka, Corfu’s second highest peak. 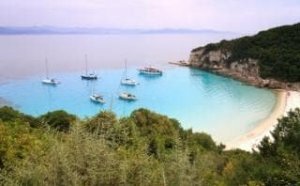 From Áno Garoúna village, a portion of the Corfu Trail leads steeply up to the top (allow an hour) for superb views over the town and airport lagoon. Well, not quite the top, which is dominated by a Greek Air Force radar golf-ball. Although only 576m in elevation, this humpbacked hillock in fact appears to be an extinct volcano; the summit conceals a shallow caldera with a lush orchard of fruit and nut trees belonging to nearby Pandokrátora monastery, no longer inhabited. 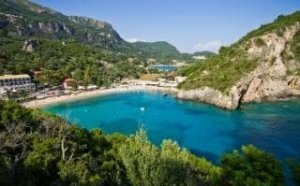 Keen walkers might consider continuing along the Corfu Trail, briefly as a cobbled mule path, down and northeast to the hill village of Ágii Déka. Just west of this busy resort, coastal sandstone cliffs have been eroded over the aeons by wind and water into otherworldly shapes. 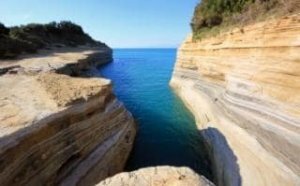 The most famous single formation is the rather regrettably named Canal d’Amour (it sounds slightly better in Greek: Kanáli tis Agápis), so named for the legend stating that by swimming the length of the channel here, lovelorn women would gain the object of their affections. More conventional bathing is available at little cliff-backed coves around the corner. Being firmly on the tour-coach circuit hasn’t diminished the appeal of this lovely eyrie, atop the bluff beyond Paleokastrítsa’s various coves. Although founded during the 13th century, the present, pastel-hued monastery (daily 9am–1pm & 3–8pm) was rebuilt after a fire some 500 years later. The church is crammed full of noteworthy icons; there are more (most noteworthy a 17th-century St George by Theodoros Poulakis) in a little museum occupying the former olive press (including the disarticulated skeleton of a whale), while burgeoning potted plants plus cascading bougainvillea fill the courtyard and the arcaded passageways around it. A half-dozen monks still live here. 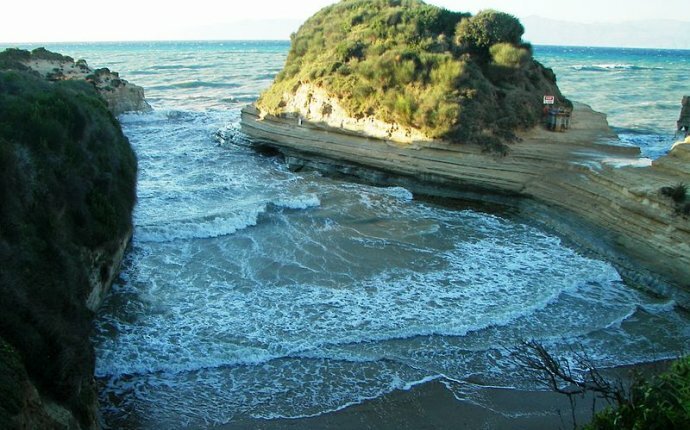 Corfu has a reputation for being one of the better scuba venues in Greece. The best dive sites are around Paleokastrítsa, Othoní or Paxí islets and the northeast coast, with visibility on good days in the 25–30-metre range; the sea lapping the island's eastern shoreline is relatively murky and thus little explored. Water temperatures reach a maximum of 24° in summer, but can plunge abruptly to 16° owing to numerous fresh-water seeps; reputable dive centres provide hood and booties as standard practice.